Born in Boulder, CO, raised in a variety of places, Sarah developed a love for creating and an appreciation for changing scenery at an early age. Some of her earlier memories include visiting her grandparents home in Cape Cod where her grandmother had an art studio. Whether Sarah was smelling the salty sea air or the crisp mountain air, she quickly learned the power the environment and atmosphere had on her creativity and emotions. Heavily influenced and inspired by physical landscape combined with her love for surprising color combinations, Sarah's work aims to capture a feeling of being in a particular moment rather than a literal depiction of a scene. 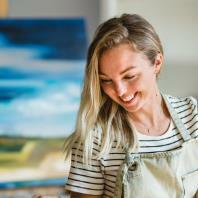 Created with her tools of choice, a palette knife and dry brush, Sarah's dream-like abstract landscapes dramatically impact the spaces where they hang nearly as much as the environment that influenced their creation. Sarah earned numerous accolades for her artwork in high school and went on to earn a BFA in painting and photography at a private university in Indiana. She has been painting professionally since 2010. 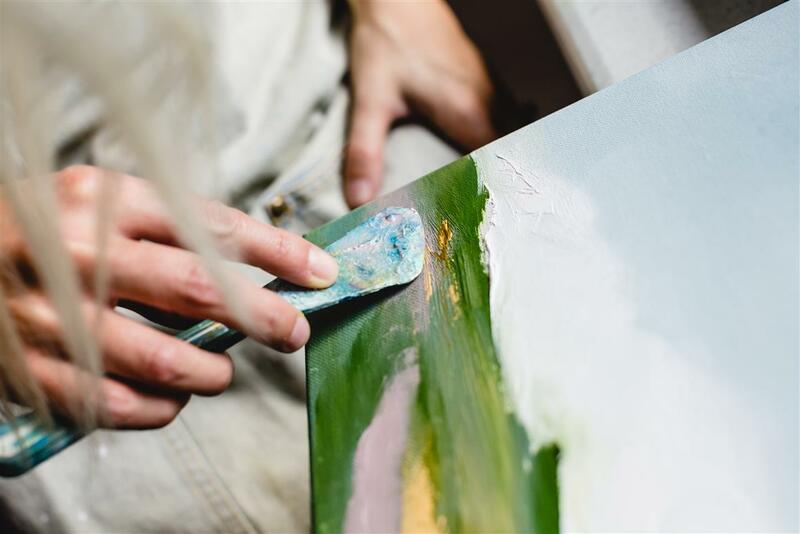 She currently paints in Franklin, TN where she also lives with her husband, daughter and golden retriever.